Often lost in the shuffle of TURN’s vision of Setauket is Richard Hewlett, played by actor Burn Gorman. 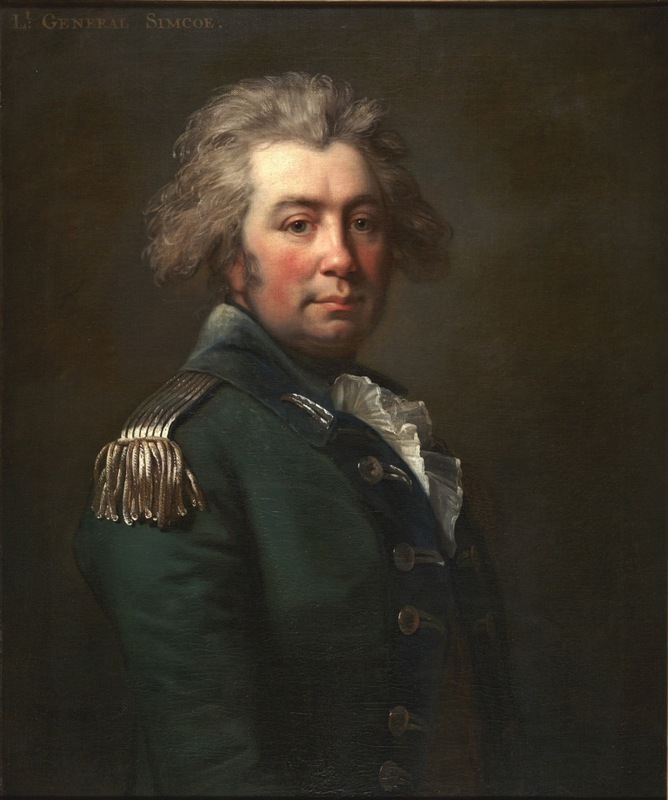 The show has decided to have this Long Island-born American loyalist portrayed as only a major, but in actuality, Hewlett served his whole seven year career in the Revolutionary War as a lieutenant colonel. In TURN, Burn Gorman delivers a convincing portrayal of Hewlett as a somewhat mild-mannered professional veritably obsessed with “law, order, and authority.” On screen, Hewlett is an aloof British outsider to the Long Island community whose unflinching dedication to his duty and occasional displays of humanity and compassion make him a sympathetic character, in spite of his role as an antagonist. His likeability has prompted many TURN viewers to wonder: What was the real Richard Hewlett like? Richard Hewlett was born on 1 November 1729 at Hempstead, Queens County, Long Island to Daniel Hewlett and Sarah Jackson. In 1753, at the age of 24, he married Mary Townsend (five years his junior) in Hempstead, and over the next twenty years they would have eleven children together, all Long Island natives just like their parents. Soon after his marriage, Hewlett would soon be swept up in the winds of war blowing between France and Great Britain – a conflict known in America as the French and Indian War. Hewlett served as Captain in a New York regiment of Provincial (read: American) troops under Colonel Oliver DeLancey and saw plenty of action in Canada. In 1758, Hewlett’s corps helped capture Fort Frontenac from the French, the site of modern Kingston, Ontario. With the end of hostilities in 1763, Richard Hewlett returned to Long Island where he became a leader in the Hempstead community and served as lieutenant colonel of the Queens County Militia. As the Revolution approached, Hewlett, through inclination and family connections, remained steadfastly loyal to the British. Indeed, Queens County by far was overwhelmingly Loyalist in its support of the British, so much so that New Jersey militia under Colonel Nathaniel Heard were sent in January 1776 to confiscate the arms of the inhabitants and render them less dangerous. Hundreds of Hempstead residents likewise signed a submission, apologizing for causing “uneasiness” in their neighbors by their politics and pledging to never take up arms against the Americans. Six members of the Hewlett family were amongst those that signed this document – but not Richard. By August 1776, William Howe’s army had landed on Long Island and by the end of the month had routed Washington’s forces at Brooklyn Heights. Amongst the first to greet the British was a large group of Loyalists from the island, possibly including Hewlett. Within a week, these men would become the very first officers and soldiers in a brigade of three battalions to be raised by (now) Brigadier General Oliver DeLancey, Hewlett’s former commander from the French & Indian War. DeLancey’s recruits would come primarily from Loyalists in Queens and Suffolk Counties of Long Island, as well as Connecticut, with a smattering of Rebel deserters and prisoners of war. Recruiting could be dangerous on Long Island during the war. 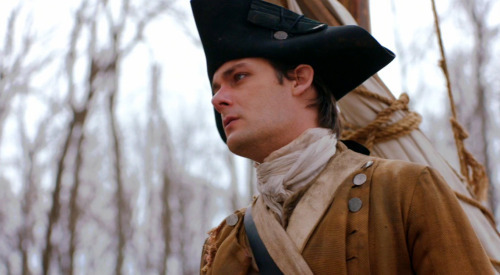 Even the very first episode of TURN featured the murder of a British officer (Captain Joyce) as a major plot point. On September 24th, 1776, one of DeLancey’s would-be officers named Miller was shot and killed by a raiding party on their way to… yes, the town of Setauket! But Richard Hewlett would face no such danger. To the west of Setauket, Queens County (despite Nathaniel Heard’s previous efforts) still remained predominantly loyal to the British, with hundreds of recruits flocking to the royal standard after hostilities began. Hewlett was commissioned on September 5th 1776 as lieutenant colonel of the 3rd Battalion, DeLancey’s Brigade, commanded by Colonel Gabriel G. Ludlow. Although liable for service anywhere in America, Lieutenant Colonel Hewlett never left Long Island during the war, nor did the majority of his battalion. As we have discussed in previous posts, Hewlett and his men were stationed at Setauket during Parsons’ August 1777 raid, a.k.a. the Battle of Setauket (depicted with considerable artistic license in in TURN’s Season One finale). “I take the Liberty to give You an Account of the Behaviour of some of the Inhabitants of this County when lately visited by the Rebels, that Your Excellency may have an Idea what kind of Subjects many of them are. Our Hospital was at some Distance from the Works – as there was not a convenient House nearby – When we were attacked by the Rebels – a Party of them was sent to it – those Sick who were able [to walk], attempting to make their Escape – were fired at. Jonathon Thompson who lives next to the Hospital, seeing which Way they ran, Called out to the Rebels “here here they run” pointing with his Hand the Way they went. Samuel Thompson Son of the above at the same Time endeavoured to intimidate the Inhabitants – By telling them – Our Fort had surrendered – that the Rebels intended staying two or three Days – and had a twenty Gun Ship and [a] Number of Privateers in the Sound – Stories well calculated to prevent our having Assistance. Selah Strong, as played by Robert Beitzel. I have this Instant while writing the following authentic Information lodg’d against a Justice Selah Strong by a Gentleman from Connecticut – that he [Strong] wrote to Genl. Parsons there were a Number of Vessels collecting Forage at Southold – Guarded by a fourteen Gun Schooner and fifty Men on Shore under the Command of Captn. Raymond – who might easily be surprised. That he secreted a Deserter three Weeks who went by the Name of Boyd – that he has repeatedly sent Intelligence to the Rebels in Connecticut of the Situation of the Troops in this Place by John and Cornelius Clark. This very Mr. Strong has pretended to be our Friend – and several Times given Information of the last named Persons being over – but not until they were gone. What Security can Government receive – while there are such Villains ready to stab her in secret? That Success may attend your Excellency’s Arms and all Traitors be discover’d is the sincere Wish of Your most oblig’d humble Servt. Map of Lloyd’s Neck, showing the fort on the left side. Courtesy Library of Congress. Click to enlarge. For the remainder of the war, Hewlett and his battalion would garrison different posts on Long Island, only occasionally seeing combat. On September 29th, 1779 Hewlett was commanding at the major post of Lloyd’s Neck, on the north shore near Huntington, when four vessels flying British colors sailed into the harbor protected by the fort where the garrison lay. Upon sailing by the fort, the ships lowered their British flags and “Showed their Thirteen Stripes.” The four rebel privateers immediately boarded and captured a brig and three sloops before being fired on by the two small four pounder cannon within the fort. Hewlett credited this artillery with the saving of over a dozen other vessels, as the rebels “Seemed not to like our Cannon.” The ships sailed off, content with their four prizes. 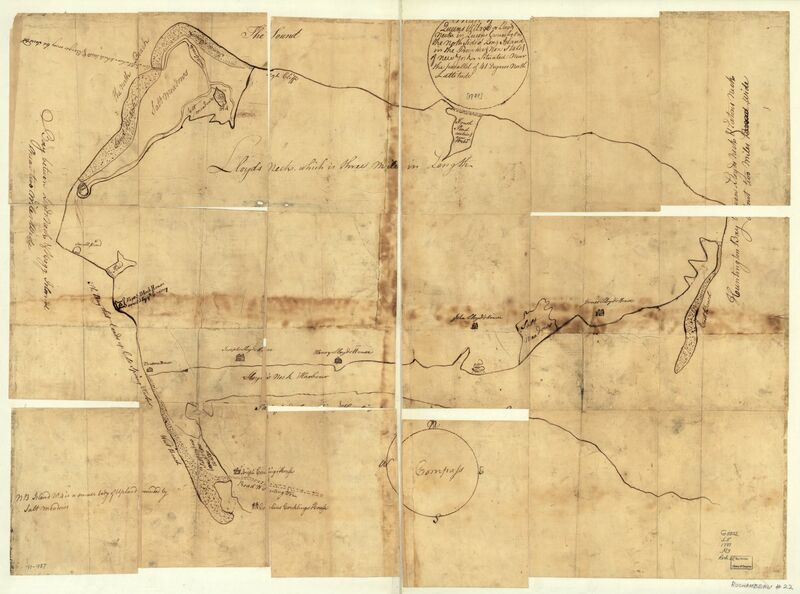 This entry was posted in Character study, Guest posts, Loyalists, Military History, Uncategorized and tagged anna strong, Battle of Setauket, General Henry Clinton, General William Tryon, long island history, loyalists, major hewlett, military history, New Brunswick, oliver delancey, queens county, Revolutionary War, richard hewlett, selah strong, setauket, todd braisted, TURN, turn amc, TURN: Washington's Spies, washington's spies. Greetings, TURNcoats new and old – and a special welcome to the scores of new spy-curious readers that found this site after binge-watching Season 1 on Netflix! The hardest part about finishing a good TV show binge is waiting for new episodes to start airing again — but thankfully, you won’t have long to wait. 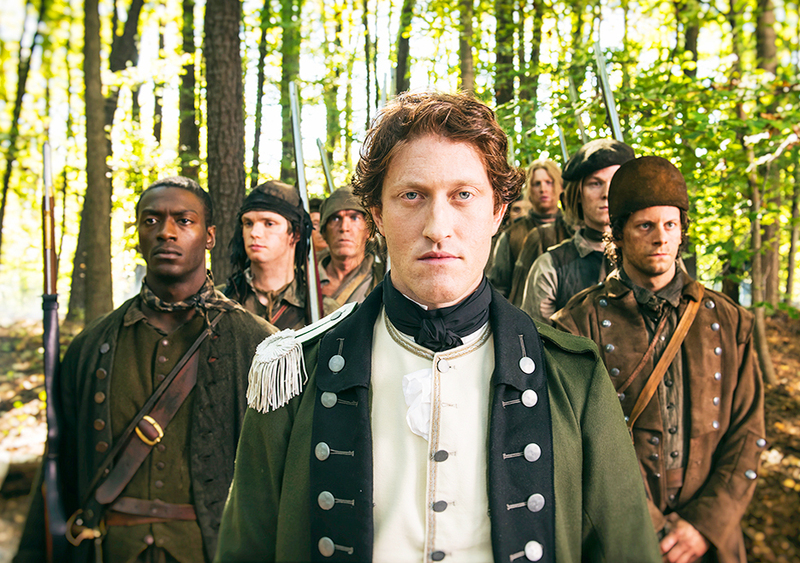 The two hour premiere of TURN Season 2 airs in less than a week from today! Not to be confused, of course, with Shippen (although there will definitely be a whole lot of Shippen going on in Season 2, according to AMC). For readers who many be unfamiliar with the latest in internet slang, I refer you to the definition above. In the context of TURN, “shipping” is an especially appropriate term to use for Abraham Woodhull and Anna Smith Strong, because their forceful on-screen romance is completely lacking any basis whatsoever in historical fact. Admittedly, for a 38 year old mother of seven, Anna looks AMAZING. Abraham Woodhull: Single, Married, or “It’s Complicated”? Next, let’s examine Abraham’s side of the equation. Obviously there’s no historical evidence for any kind of romantic attraction between him and Anna – but in addition to that, in TURN he is a not-so-happily married man with a young son. We’ve already pointed out in previous posts (and the Historical Timeline) that Abraham Woodhull didn’t marry until 1784, after the conclusion of the war. (Nor did he ever have a son OR an older brother named Thomas, but we’ve already covered that, too.) In the alternate universe of TURN, the fact that Abraham and Anna are married makes their affair even more dramatic, naturally. But prematurely “marrying off” Abe cancels out one of the most interesting and significant common factors between most members of the Culper Ring: their bachelorhood. Here we see Abraham Woodhull pictured with two very good reasons NOT to get involved with espionage. Obviously, giving Abraham Woodhull a wife and son multiplies the level of dramatic tension and nail-biting suspense in the show on both the espionage and romantic fronts. But historically, that’s exactly the kind of family situation that would have likely ruled him out as a participant in the Culper Ring in the first place. In conclusion: The romantic drama between Abraham Woodhull and Anna Strong seen in TURN may be totally made up — but that’s not to say the real Culper saga is lacking in historical romance! This entry was posted in Character study, reader request, Uncategorized and tagged Abraham Woodhull, amc turn, anna strong, benjamin tallmadge, Caleb Brewster, culper spy ring, genealogy, mary woodhull, peggy shippen, reader request, selah strong, setauket, Thomas Woodhull, TURN, turn amc, TURN origins, TURN origins comic, TURN: Washington's Spies, washington's spies. Episode 9 of TURN, “Against Thy Neighbor,” introduced yet another example: The good Reverend Nathanial Tallmadge, fiery patriot and dutiful father to our favorite dragoon major. His refreshingly straightforward character is pretty much impossible not to like. If his speech from Episode 9 doesn’t rouse your inner American Revolutionary, you’re probably a Loyalist then I don’t know what will. 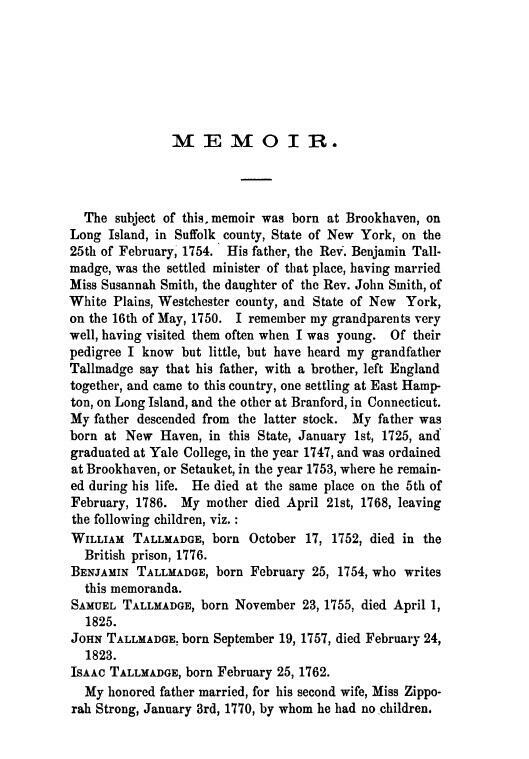 Benjamin Tallmadge outlines his immediate family tree, which includes the proper names of his father and brothers, on page one of his Memoirs. Click to enlarge. However, if you’re a viewer who is interested in historical accuracy (and you likely wouldn’t be here if you weren’t), you might be surprised to learn that Benjamin Tallmadge’s real father — who was indeed the pastor of Setauket’s Presbyterian church and opposed the loyalist occupation of his town — was also named Benjamin Tallmadge. (Benjamin Tallmadge Senior, of course.) In fact, there is no “Nathanial Tallmadge” in Major Tallmadge’s immediate family tree. Thankfully, Benjamin Tallmadge himself clears things up for us on the very first page of his memoirs (pictured at right). In a similar case of mistaken identity, it was actually Benjamin’s eldest brother William, not his brother Samuel, who perished as a prisoner of the British Army in 1776. The Tallmadges, however, aren’t the only Long Island family that might look funny to any genealogists who happen to watch TURN. The Woodhull family tree is also beset by a number of identity (and existential) crises. While Abraham Woodhull did have an older brother who died just before the Revolutionary War began, his name was Richard, not Thomas. Similarly, when Abraham finally did get married and have children (which wasn’t until 1781, as seen on the Historical Timeline), he did have a son, but he was named Jesse, not Thomas. There is no Thomas Woodhull anywhere in Abraham’s immediate family tree. The two charts below contain biographical information about the branch of the Woodhull family tree that’s of most interest to TURN viewers. Note that there’s no “Thomas” to be found anywhere. The images are screencaps from longislandsurnames.com, a site I highly recommend to any TURN fans who want to investigate the family histories of Long Island revolutionaries for themselves. You might want to bookmark the site if you’re trying to keep track of the multiple families mentioned on TURN. In both of these family cases, the relatives in question “did” exist, which makes TURN’s naming conventions even stranger. Benjamin’s clergyman father, Benjamin’s brother who died in British custody, Abraham’s son, and Abraham’s older brother who died prior to the start of the war were all real people in the historical record. But for some reason, the names for all these “real-life” characters have been swapped out for fictional ones in the show. As the keeper of this blog and all the social media accounts connected with it, I often get asked why the writers and showrunners of TURN would alter history in the ways that they do. (For example: “Why would they change the names of real people like Benjamin Tallmadge’s father?”) In the case of the martyred ‘Samuel’ Tallmadge, the show implies (in Episode 6) that he was the inspiration for the first half of Abraham Woodhull’s “Samuel Culpeper” alias, so that’s likely why the writers swapped the names of the Tallmadge brothers. As for the others… well, since historical accuracy is evidently not a factor, your speculations are as good as mine! Nor do I know why Abraham Woodhull’s alias is named “Culpeper” in the show, and not “Culper,” which was obviously the real name at the heart of the eponymous Culper Spy Ring. Since it was Washington’s suggestion in the show, it might have to do with his connection to Culpeper county, Virginia. Either way, I’m assuming that will be changed/explained in a future episode. Perhaps these other naming conventions will be, too. Hey, even MORE reason to call for a second season! Both the TV show and the TURN Origins comic imply that Abe and Anna as roughly the same age and grew up as children together in Setauket. In reality, Anna was ten years older than Abraham. 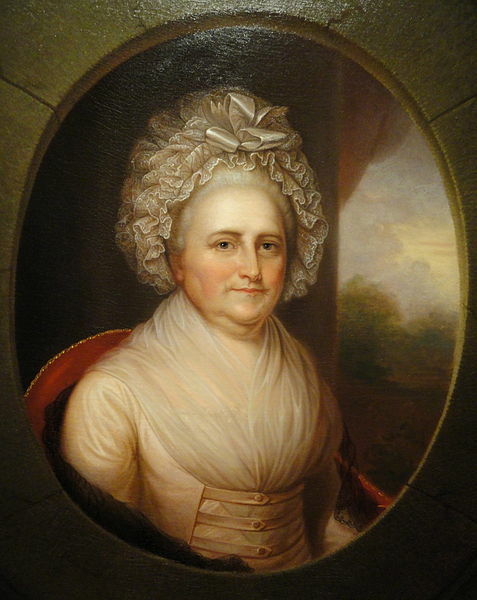 She married her husband Selah in 1760, when she was twenty and Abe was just ten years old. (Needless to say, there was never any promise of marriage between the two.) Anna was pretty well invested in her marriage, too: by 1776 she and Selah had six children, with more to follow soon (some of whom had fantastically patriotic names, as seen on Anna’s family page). Of course, it’s no surprise that TURN (or any TV drama, for that matter) is chasing after sexual tension in hopes of pleasing a modern-day audience. But just in case there was any lingering doubt: the on-screen romantic relationship between Abraham Woodhull and Anna Strong has no historical basis whatsoever. This entry was posted in Character study, reader request and tagged Abraham Woodhull, anna strong, benjamin tallmadge, culper spy ring, genealogy, nathanial tallmadge, reader request, richard woodhull, selah strong, setauket, Thomas Woodhull, TURN, turn amc, TURN origins comic. 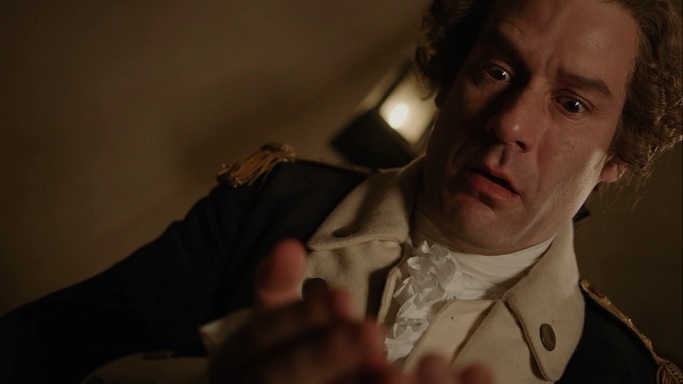 Just in case you’ve been watching TURN in hermetic isolation or have only seen the episodes that don’t feature Major John Andre as a main character, I’m referring to the little white braid seen here. Here it is, readers: the oft-requested, long-awaited Braid Post. Major Andre’s mysterious white braid has been the subject of heated discussion among TURN viewers since day one, who — regardless if they love it or hate it — are dying to find historical justification for its appearance in the show. 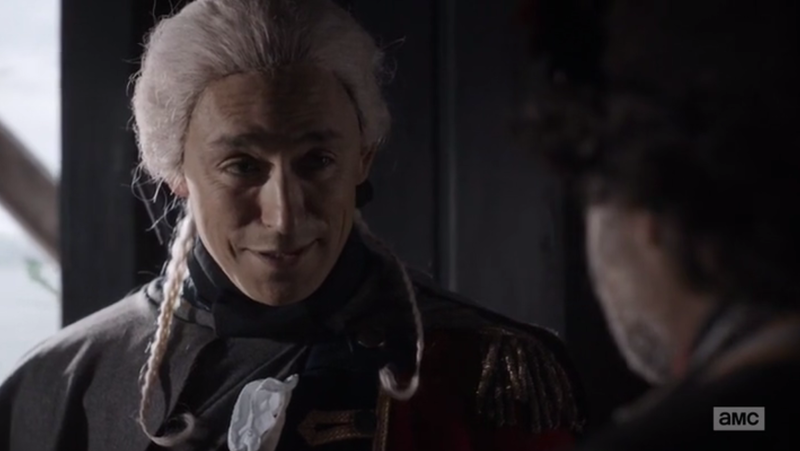 If I had a dollar for every time someone mentioned John Andre’s braid in their discussion of TURN, I might have enough money to buy my own cabbage farm on modern-day Long Island. (Although, since I’m more of a Major Hewlett-esque oenophile, I’d probably opt for a vineyard instead). 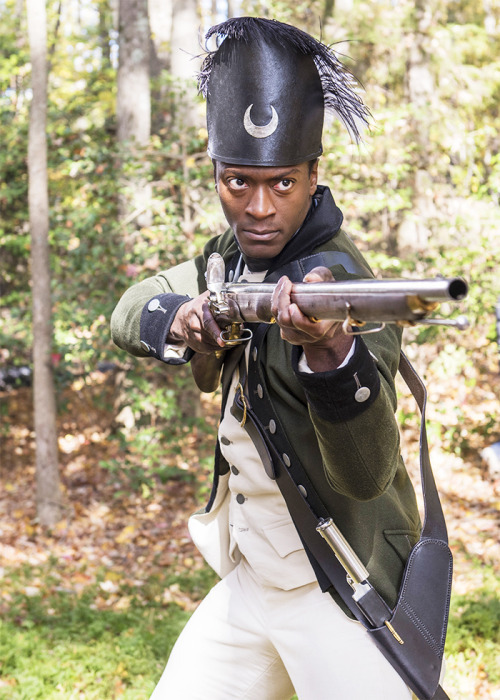 In this still from the first episode of TURN, you can see both of Andre’s braids. Click to enlarge. Plenty of 18th century wigs AND natural hairstyles featured braided queues, of course — but nothing like the tiny silver braid running down the side of Andre’s head. As we can see in the screencap to the right, Andre’s “side-braid” is not the same as the braided queue on his dress wig. 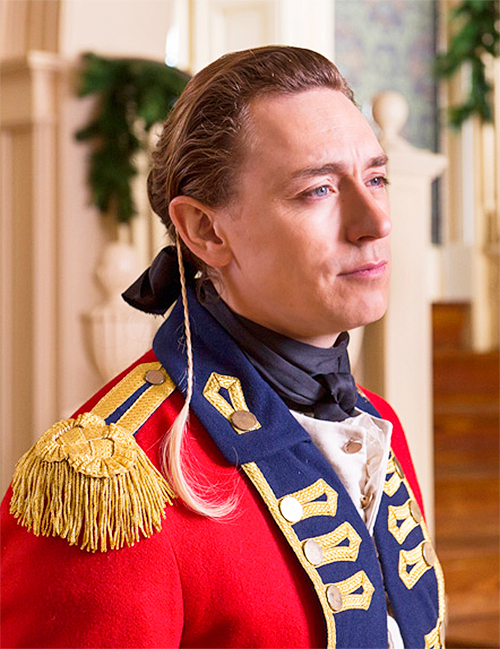 While the widespread lack of evidence does show that these little braids were not fashionable or popular during the American Revolution, I figured that the production team at AMC must have seen something that inspired them to include such a conspicuous and unusual fashion accessory for Major Andre’s character. So I held off on writing a post about The Braid, and kept searching. Finally, I happened upon an obscure painting in the collection of the Huntington Library in San Marino, CA, titled “A Soldier, called Major John Andre.” Lo and behold, there appears to be a tiny silver plait running behind the subject’s left ear! Mystery solved! Historical justification for Major Andre’s braid in TURN. It’s an open-and-shut case, right? 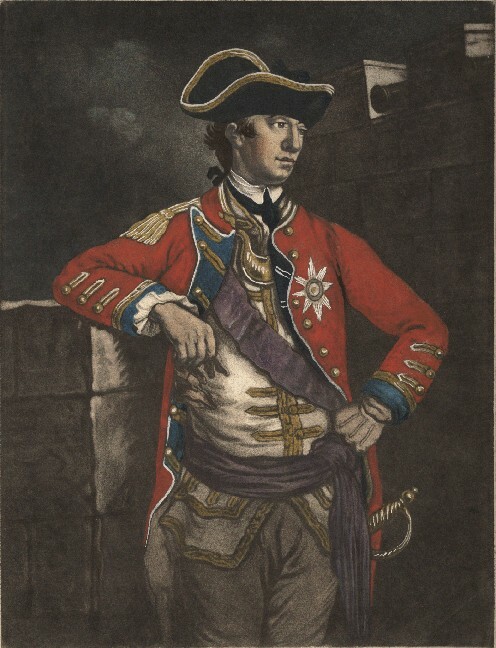 “A soldier called Major John Andre,” from the collection of the Huntington Library in San Mateo, CA. Analysis by British military historians has determined that this painting is NOT the Major John Andre of Revolutionary War fame. Click to enlarge. Well… not entirely. For one thing, this isn’t actually John Andre. Not the John Andre we’re all thinking of, anyway. If you look at the catalog entry for this painting on the Huntington Library’s website, you’ll see that the artist, the provenance, and even the date of the painting are all unknown. We do know, however, that John Andre belonged to the 7th Regiment of Foot, also known as the Royal Fusileers (or Fuzileers, if you use the preferred 18th century spelling). 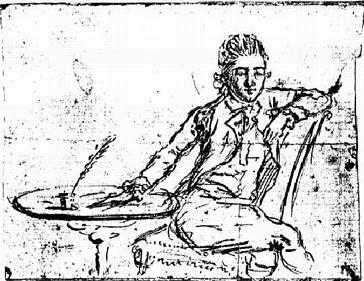 So if this IS the John Andre we’re familiar with, he should be wearing a Royal Fuzileers uniform appropriate to the era of the American Revolution. The lace on the regimental coat is the wrong metal– the 7th Royal Fuzileers had gold lace, while this officer has silver. The buttons are in pairs, a practice that is as yet undocumented to the 7th Regiment during the period in question, and which in general is more indicative of a later-war or into the 1780s date. The wing [patch] on the shoulder, while appropriate for light infantry, features the three feathers of the Prince of Wales. 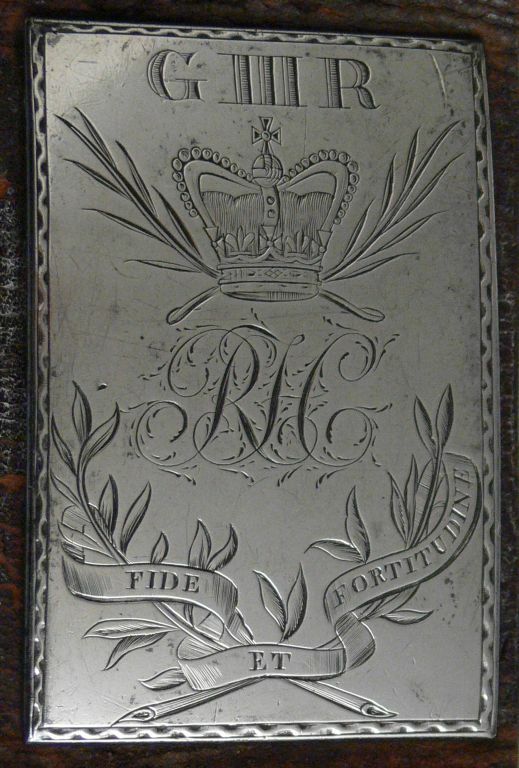 This was a special insignia reserved for a short list of regiments that enjoyed the Prince’s patronage — a list which did not include the 7th Regiment. The helmet is of the so-called Tarleton style, so identified because Banastre Tarleton sports one in his British Legion portrait. This one includes a leopard-skin turban, usually seen on Light Dragoons. The helmet does not match the style of light infantry cap authorized for British troops by the 1771 Light Infantry warrant [regulations], nor does it correlate with any of the non-regulation hat-caps and other light infantry headgear that have been documented to this period. 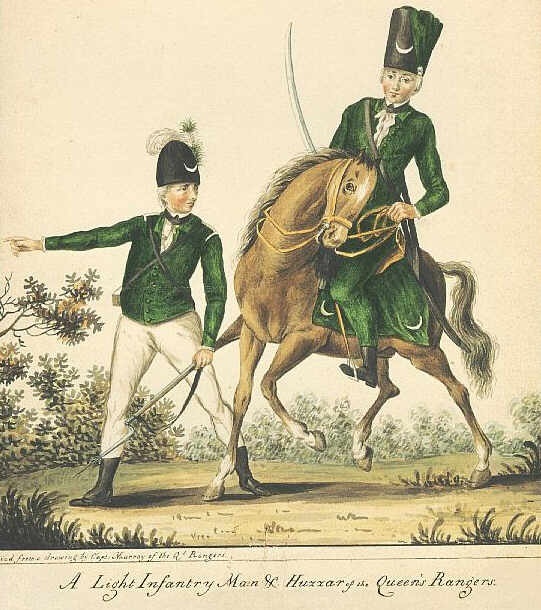 There is some suspicion that the Tarleton Cap became the accepted light infantry cap after 1784, but there is as yet no hard documentation to back this idea up. Since the Tarleton Cap was a mid-war innovation, its presence suggests that the portrait dates from after 1777. Also notable is the portrait’s background: St. Paul’s Cathedral in London. This would be a strange choice for Andre, who served exclusively in America. Finally (though this point might be debatable), the facial features of this sitter don’t match well against other purported portraits of Andre that have superior provenance. 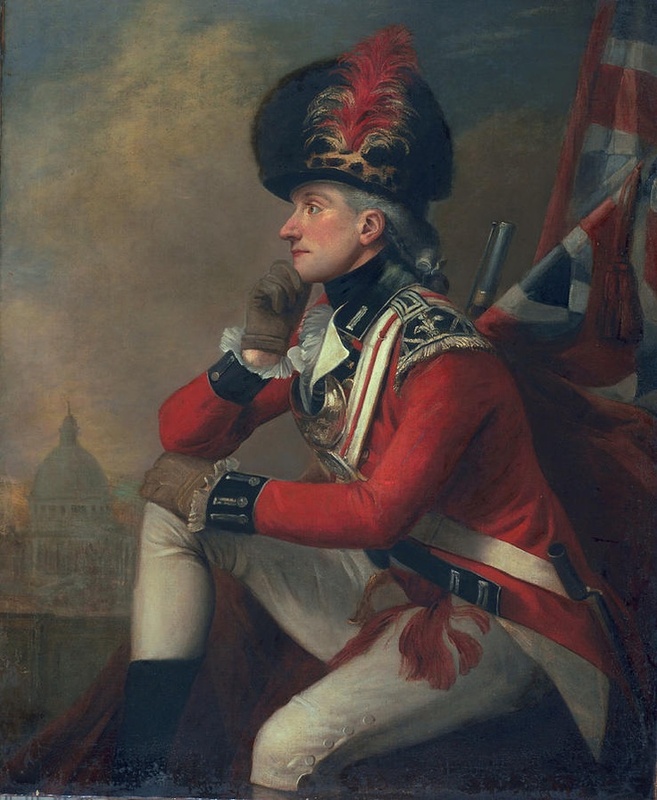 It’s quite possible that this painting is of another completely unrelated British soldier named John Andre, which was not an especially unique name in late 18th century Britain. It’s also quite possible that this painting was mistakenly mislabeled sometime in its shrouded history. Either way, there is little doubt that this painting was the inspiration for Major Andre’s braid in TURN — so at least that mystery has been solved. It is also clear that this painting does not provide solid historical justification for the way Andre’s braid is depicted in the show. Regardless of the soldier’s identity in this painting, it is clear that the little braid is part of his wig, not grafted onto his natural hair or scalp. As we see in the pictures above, the designers went out of their way to show that the little braid is a separate entity. Even if Major Andre’s braid has some creative backstory that is slated to be revealed on a future episode TURN, it is clearly an example of historical fiction, not historical fashion. So there you have it, readers — hopefully the above foray into historical fashion has shed some light on one of the most elusive and talked-about depictions of material culture in TURN thus far. (The other one being, of course, Abe Woodhull’s wool cap.) Spread the word! And if you have any more questions or braid-theories, send them this way via the ask page, tumblr, or Twitter. And don’t forget to follow along for the live-blogging on tumblr and Twitter tonight! This entry was posted in Character study, clothing, material culture, reader request and tagged 18th century fashion, banastre tarleton, braid, historical costuming, john andre, military history, military uniforms, reader request, TURN, turn amc, wigs. Talk about sneaky: If you’re a Connecticut resident who makes a habit of reading the newspaper, you may have had a spy-curious encounter this morning without realizing it! If you’re a Connecticut resident and history buff, I highly recommend picking up your own physical copy of today’s paper if you can get one, which contains large, gorgeous imagery and a beautiful, full-color timeline of Connecticut’s military innovations (including submarines, Colt revolvers, gatling guns, helicopters, and more) in addition to a slew of articles covering famous war veterans from the past 250 years. I’m delighted to have been able to help with their efforts to commemorate notable Connecticut war veterans (especially since Tallmadge happens to be one of my favorites)! Enjoy the article, and don’t forget to tune in tonight for an all-new episode of TURN at 9:00pm Eastern! I’ll be live tweeting @spycurious and tumblring (if that’s what the kids are calling it these days) at spycurious.tumblr.com. 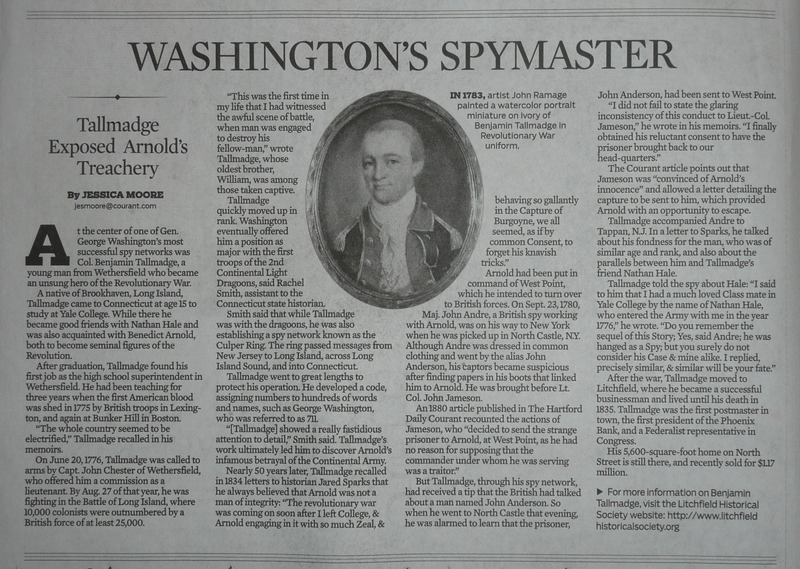 This entry was posted in Character study and tagged benedict arnold, benjamin tallmadge, connecticut history, culper spy ring, hartford courant, TURN, turn amc, washington's spies.